Leading specialist modern warehousing property investment company Africa Logistics Properties (ALP) has signed a $26.5m senior debt loan facility with Stanbic Bank Kenya Limited (Stanbic Bank), a subsidiary of Standard Bank Group (Standard Bank). The facility proceeds will be used for future expansion of ALP’s modern warehousing projects in Nairobi. ALP’s flagship project 'ALP Nairobi North’ is Kenya’s first international standard grade-A logistics and distribution centre. The project consists of 47,000sqm of grade-A international standard warehousing on a 22-acre site. The first two phases of the ALP North park are over 80% leased and the third final phase of 19,600sqm will be delivered in May 2019. ALP Nairobi North won the Best Industrial Project in Africa award at the 2018 Africa Property Awards and also achieved the World Bank’s EDGE building sustainability certification – the very first industrial warehousing complex to achieve this benchmark in Africa. In addition to ALP Nairobi North, ALP has also commenced construction of its second logistics and industrial project called ALP Nairobi West on a 49-acre site in Western Nairobi. ALP West is situated on the A104 highway towards Limuru, with planning approval for a 100,000 sqm logistics and distribution warehousing complex, the largest in East Africa. Africa Logistics Properties (ALP) has signed a long-term lease for 3,000 sqm of its flagship ALP North Logistics & Distribution Complex with Kensta, the largest regional print and packaging company in East Africa. The Kensta Group is a 52-year-old third generation family business, with headquarters in Kenya and operations in five East African countries (www.kensta.com). Since inception, Kensta, through its various investments has played a pivotal role in the East African printing and packaging industry and has been instrumental in changing the face of office automation and IT managed services in the region. ALP has constructed Kenya’s first international standard grade-A logistics warehousing on two sites in Nairobi. ALP North, ALP’s first project, is a 50,000sqm logistics and distribution complex at Tatu Industrial Park in Northern Nairobi which completed in September. ALP West, ALP’s second project, has just completed the road infrastructure on its 49-acre site on the A104 highway to Limuru, with plans for a 100,000 sqm logistics and distribution warehousing complex. It also demonstrates the degree to which the international quality and design of ALP’s distribution and logistics facilities are disrupting the traditional ‘godown’ warehouse market, which has long suffered from small, poor quality units that are not fit to support the kind of modern logistics operations needed by growing regional and international companies in East Africa. ALP, which rents its modern warehouse units to occupiers on long term leases, has already leased over 20,000 sqm of its first two units at its ALP North warehouse complex. The final phase 3 unit of 20,000sqm, the largest warehouse in Nairobi, will be complete for occupation in May 2018 and is already 20% pre-leased. The rapid rate of fill at the logistics park has been driven by features such as the high floor load bearing capacity, 12 m operating heights, and lower operating costs due to environmental features such as solar powered electricity. The ability to stack products up to 12 m high, alone, reduces overall warehousing costs by 30 per cent compared to traditional ‘go-down’ warehouses. Africa Logistics Properties (ALP) is a specialist integrated property investment company that develops, acquires and owns class-A industrial and logistics properties in principal cities across Africa. ALP leverages its team throughout the region via a deep understanding of global customer and logistics demands, international best practices in warehousing design specifications, construction and property management along with local expertise in market dynamics, site selection and regulatory approvals. ALP is supported by global institutional shareholder investors. The company has developed Nairobi’s first international grade-A logistics warehousing park and has commenced its second park at ALP West in Western Nairobi. Africa Logistics Properties (ALP) has signed a long-term lease for nearly 4,500 sqm of its flagship ALP North Logistics Warehousing Complex with Copia, the fast growing e-commerce retailer that specialises in supplying consumers in rural and peri-urban Kenya. ALP is currently constructing Kenya’s first international standard grade-A logistics warehousing on two sites in Nairobi. 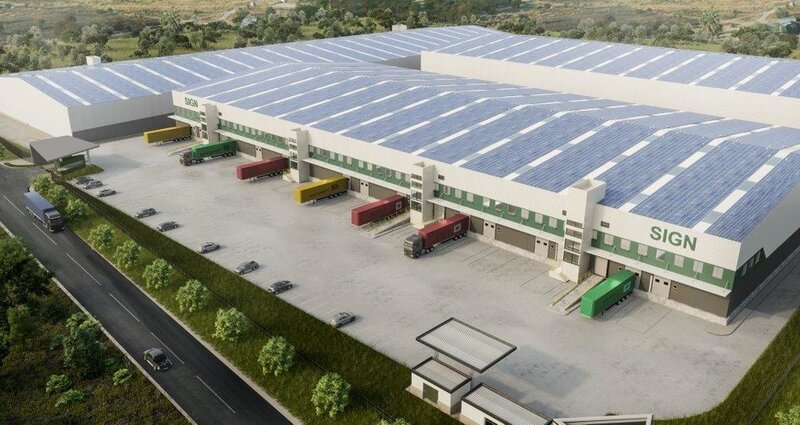 ALP North, ALP’s first project, is a 50,000sqm logistics and distribution complex at Tatu Industrial Park in Northern Nairobi due for completion in September. ALP West, ALP’s second project, is now building the road infrastructure on its 49-acre site on the A104 highway to Limuru, with plans for a 100,000 sqm logistics and distribution warehousing complex. Copia’s ALP North lease will enable the company to operate from ALP’s 12 metres high warehousing and to benefit from the highest pallet densities in the market and therefore the lowest pallet storage costs per square metre. Copia will be able to run thousands of deliveries a day from the e-commerce company’s new central distribution centre to its agent network across the regions. It also demonstrates the degree to which the international quality and design of ALP’s distribution and logistics facilities are disrupting the traditional ‘godown’ warehouse market, which has long suffered from small, poor quality units that are not fit to support the kind of modern logistics operations needed by regional and international companies in East Africa. “E-commerce requires distribution efficiencies, rapid access, ease of entry and exit, and modern logistics software, to achieve truly efficient warehouse management,” said Toby Selman CEO of ALP. ALP, which rents its modern warehouse units to occupiers on long term leases, has already leased 14,000 sqm of its Phase 1 warehousing to Freight Forwarders. The Phase 1 warehousing will be complete for occupation in September 2018. This is a key feature for e-commerce operations seeking to contain logistics costs. The e-commerce sector is expanding rapidly in Africa with revenues last year of $16.5bn projected to reach $28.9bn by 2022, according to international statistics portal Statista. In this, East African e-commerce sales are set to surpass West African e-commerce sales for the first time in the first quarter of this year, according to JLL’s Africa Prime Industrial Report. “Copia is a fast growing business serving the rural regions of Kenya with relevant products. By operating from Nairobi’s first grade-A logistics distribution complex, it will gain significant competitive advantage, benefitting from lower supply chain costs per pallet, and ultimately benefitting Kenyan consumers,” said Toby Selman. The need for sophisticated warehousing and logistics facilities is key for e-commerce operations. Tim Steel, CEO of Copia, commented: ‘Copia provides a unique direct to end consumer e-commerce enabled shopping service, bringing choice, convenience and opportunity to rural and peri-urban customers across Kenya. This involves a complex and challenging supply chain. We are very excited to be relocating our fulfilment centre operation to ALP North Logistics Park. The facility is ideally located for us and our suppliers and perfectly suited for us to reliably meet the day definite delivery needs of our customers. It will allow us to continue our rapid growth in using e-commerce to supply FMCG, construction and farming inputs more effectively and efficiently directly to previously underserved communities’. Africa Logistics Properties (ALP) is a specialist integrated property investment company that develops, acquires and owns class-A industrial and logistics properties in principal cities across Africa. ALP leverages its team throughout the region via a deep understanding of global customer and logistics demands, international best practices in warehousing design specifications, construction and property management along with local expertise in market dynamics, site selection and regulatory approvals. ALP is supported by global institutional shareholder investors. The company is currently developing Nairobi’s first international grade-A logistics warehousing parks. Africa Logistics Properties (ALP) second grade-A logistics and distribution park, ALP West, is underway in Western Nairobi. Strategically located on the A104 Nairobi-Nakuru highway on 49 acres we will be developing up to 100,000sqm of international standard warehousing for the occupier rental market for delivery in 2019. Construction is underway on the highway junctions and internal roads with delivery of the first phase due in the summer 2019. We are delighted to welcome Robert Etchells to our growing team as ALP's new CFO. Robert has 13 years finance experience across Europe, Africa and Asia. Prior to joining ALP Robert was CFO at the China Navigation Company, one of the world's largest bulk shipping companies and a member of the Swire Group. He is a member of the Chartered Institute of Chartered Management Accountants and is an INSEAD graduate. Rob will be based in Nairobi. Construction progress continues ahead of schedule at our 50,000sqm ALP North site in Northern Nairobi, Kenya's first modern class-A logistics and distribution centre for the occupier rental market. Our second unit of 14,000sqm now has its steel frame being erected. Africa Logistics Properties has agreed lease terms with an e-commerce distributor for 4,400sqm at ALP North, Nairobi's first international standard class-A Logistics and Distribution Centre. We have leased over 18,000sqm of our space in our flagship Nairobi project over the last four months. Africa Logistics Properties continues ahead and on schedule with construction of Kenya's first international standard logistics and distribution centre at Tatu Industrial Park. Groundworks are complete on the first two warehouses of 14,000sqm each and foundations are nearly all in place on the first warehouse. Africa Logistics Properties (ALP) has signed a 10-year lease for 14,000 square metres with Freight Forwarders Solutions Ltd (FFS), the contract logistics arm of the leading regional logistics group Freight Forwarders Kenya (FFK). Freight Forwarders Solutions will occupy the entire first warehouse complex of 14,000 sqm at ‘ALP North’, Kenya’s first international standard modern logistics and distribution complex of 50,000 sqm. which ALP are currently constructing at a site on Tatu Industrial Park. The ALP complex will be operational by October 2018. The lease deal represents the largest industrial lease signed to date in Kenya. “We are delighted to be supporting Freight Forwarders Solutions contract logistics business with our modern grade-A logistics warehousing complex, which will be the first of its kind in Kenya. As a first mover into our facility, FFS will have a competitive advantage in the contract logistics market where they will benefit from lower per pallet storage costs, operational efficiencies and lower operating expenses due to our warehouse modern design and environmental features.” said Toby Selman, CEO of Africa Logistics Properties (ALP). ALP is working with a number of leading international and regional companies seeking to improve their warehousing facilities, supply chain infrastructure and profit from improved cost efficiencies. Africa Logistics Properties (ALP) is a specialist integrated property investment company that develops, acquires and owns class-A industrial and logistics properties in principal cities across Africa. ALP was founded in 2016 by Toby Selman and strategic investor Maris. ALP leverages its team throughout the region via a deep understanding of global customer and logistics demands, international best practices in warehousing design specifications, construction and property management. ALP is supported by global institutional shareholder investors. The company is currently developing Nairobi’s first international grade-A logistics warehousing parks as part of its overall pan-Africa roll-out strategy. DOB Equity, a leading Dutch family office, will invest up to US$4mn in Africa Logistics Properties Holding (ALP), a developer and manager of modern grade-A warehousing in Kenya, to allow the firm to build warehousing developments and expand its operations across East Africa. DOB Equity will invest alongside CDC Group, the UK’s development finance institution; IFC, the private sector focused global development institution and member of the World Bank Group, and Co-Founder Maris, a diversified investment group operating across African frontier markets, Mbuyu Capital, the UK asset manager and other local and international investors. DOB Equity says that a well-functioning logistics sector is crucial for economic development. Currently, both international and local companies are being constrained by a lack of modern, high quality and efficient warehousing across the region. DOB Equity explains that ALP seeks to tap into this underdeveloped warehousing sector by providing grade-A, international standard warehousing and offering tenants access to international standard distribution and logistics services. Africa Logistics Properties (ALP) has agreed terms with an international occupier to lease the entire first unit of 14,000sqm at our ALP North project in Northern Nairobi, the largest industrial lease to date in Kenya. Our ALP North project of nearly 50,000 sqm currently under construction will be the first international standard grade-A logistics and distribution park in Kenya for the rental occupier market. It's all go for the ALP team in Kenya. Earthworks have commenced on schedule at our 50,000 sqm Northern Nairobi development, ALP North, which will be Kenya's first international grade-A standard logistics and distribution park for the occupier rental market which we will be delivering in Q4 2018. CDC Group, the UK’s development finance institution, and IFC, a member of the World Bank Group, will invest up to US$35 million in Africa Logistics Properties Holding (ALP), a developer and manager of modern grade-A warehousing, filling an important gap in logistics infrastructure in the region. The investment – US$25m from CDC and US$10m from IFC - will be used for ALP’s developments in Nairobi, Kenya, the trading hub of East Africa, where the lack of quality international standard warehousing space has long been a constraint on business growth and economic development. Quality warehousing improves operational efficiencies by reducing waste from poor storage, increasing the speed of product delivery and improving product security. The cost of moving goods in Africa is estimated to be on average two or three times higher than in developed countries and transport costs can count for as much as 50-75% of the retail price of goods. By investing in ALP, both the IFC and CDC are supporting Africa’s growing trade, both within the continent and overseas. ALP is backed by Maris, a Nairobi based private investment business focused on sub-Saharan Africa which will invest US$8million. IFC and CDC are also joined in the project by Mbuyu Capital Partners, an Africa-focused UK-based asset manager with an investment of up to $5 million, among others. ALP will be led by founder Toby Selman, an experienced emerging markets warehousing developer, and a Nairobi based team with African and international experience. “IFC and CDC not only bring capital and expertise as experienced investors in African infrastructure, but are also both committed to helping ALP deliver modern logistics parks with world-class environmental and social risk management standards,” said Toby Selman of ALP. ALP warehouses will adhere to IFC Edge green buildings standards. Africa Logistics Properties ('ALP'), the specialist pan-African modern logistics warehousing developer and investor, is pleased to announce the completion of a 49-acre industrial land acquisition in Western Nairobi. ALP intends to develop Nairobi's first modern industrial park in phases with up to 80,000 sqm of modern international standard grade-A warehousing for light industrial, logistics and distribution uses by occupiers. The ALP project will provide units of 5,000 sqm and larger to grade-A specifications, direct access to the Western Highway from Nairobi to Nakuru, 24-hour comprehensive security and utilities infrastructure incorporating environmental technologies to international standards. In addition, ALP will develop “Built-to-Suit" options for companies to meet their specific requirements. According to the 2016 World Bank Logistics Performance Index, Kenya moved up to rank second after South Africa in the index that ranks 160 countries. Africa Logistics Properties ('ALP') is pleased to announce that it has secured a second strategically located industrial land plot of 49 acres in western Nairobi, Kenya. ALP now has a total of 71 acres of industrial zoned land in the city on which it intends to develop the first modern grade-A distribution centre warehousing for the occupier rental market in 2017. Africa Logistics Properties (ALP) has agreed and signed heads of terms today for 22.3 acres of industrial-zoned land in northern Nairobi. ALP intends to develop up to 45,000 sqm of modern grade-A warehousing on the site in phases starting in 2017. © 2016 Africa Logistics Properties Holdings Ltd. All rights reserved.